MAKE ALL YOUR LITTLE PRINCESS' DREAMS COME TRUE! Take your first step to winning a CAR! Teddy Bear Crowns To Be Won! THESE SPECIALS CAN NOT BE COMBINED WITH ANY OTHER DISCOUNTS! Beary Special National is 2 Separate Pageants! Do One - or Do Both!!!! You can win 2 ca$h prizes & 2 crowns! ...and you only have travel, lodging and H&M expenses for one! Beary Special National is 2 Separate Pageants! Do One - or Do Both!!!! MAKE YOUR HOTEL RESERVATIONS ASAP! February 2009 Could Be Your Turn!!! Do ONE or Do BOTH! Bell Visage Shooting Mon & Tues.
Get all events for only $795 includes:registration fee, 1 parent pass 1 contestant party pass, national award, dvd, beauty, swim, black and white photo, all best awards, all optionals, perfect face, talent, cover, centerfold, everything you need to win your share of $60,000 in bonds. $100 deposit holds you spot- spots filling quickly book today. 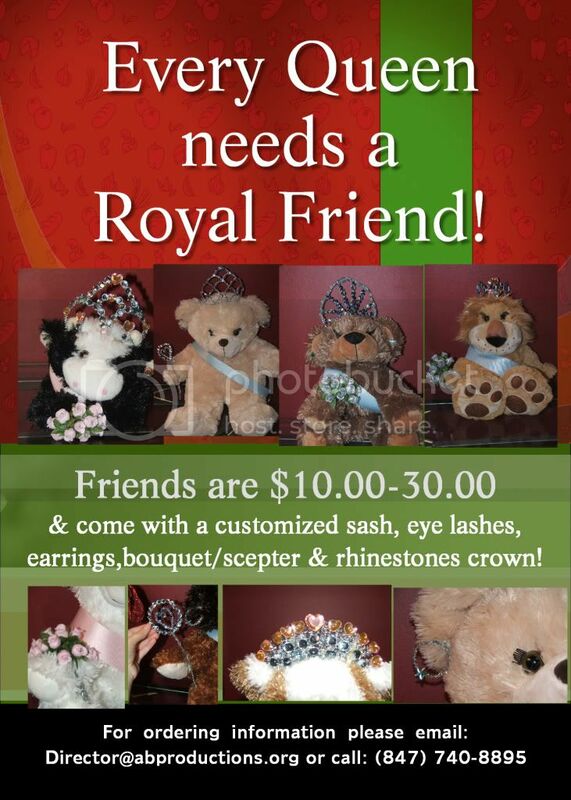 100+ Custom Teddy Bear Crowns To Be Won! MAKE YOUR HOTEL RESERVATIONS TO GET THE BEST SPOT. FEB 1st IS THE CUT OFF, FOR SPECIAL RATE! We've Added MORE Novice National Titles!! You Wanted More Novice Titles - You Got It! We Have Added 4 Novice Supremes! Over 100 Titles To Be Won! Come Get Your Teddy Bear Crown!! MAKE YOUR HOTEL RESERVATIONS TO GET THE BEST SPOT, FEB 1st IS THE CUT OFF FOR SPECIAL RATE!! BIG BIG Beary Special News!!! ....AND NOW WE'VE ADDED MORE WAYS TO WIN!!!! Beauty Only Titles have been added on both the glitz AND natural side! America's Regal Gems has changed to a LEVEL pageant this year. ENTER by February 1, 2009 receive Beauty, all events and registration fee for only $550 you will also receive entry into ARG Amethyst Supreme. DON�T MISS THIS EVENT.� We added LEVELS but awards stay the stay. Awards include portable dvd players, MP3 players, IPOD, DVD players, stereo, television, diamond, emerald, sapphire, ruby jewelry, digital camera, tons of dolls, toys, games, stuffies, webkinz, mushabelly and so much more in addition to all our savings bonds. � Everyone receives a special personalized gift. At ARG we feel you are all winners. � Everyone is recognized on stage during our award ceremony. � Everyone receives a gift. � NO ONE goes home empty handed. WOW, This BEAUTIFUL CROWN could be YOURS! Along with a $5000 Bond! Paperwork is online. We're going to have lots of FUN! Email us to be added to our email group to receive unadvertised specials and discounts. Discover what your competition already knows! Sorry we cannot share samples, we are protecting their investments. CHECK OUT PAGEANT SYSTEM THAT HAS EVERYONE TALKING! Patsy's Live Remote will be at Our Nationals! Only 7 contestants per age group! $50.00 deposit will hold your spot! Don't miss our earlybird specials!! GET YOUR DEPOSIT IN BY CUT OFF DATE AND RECEIVE A VERY NICE RQA MARDI GRAS SHIRT WITH YOUR NAME EMBROIDERED ON THE BACK! ATTENTION H/M & TANNING IF YOU WOULD TO BE ADDED EITHER PAGEANT PLEASE EMAIL ME! GRAND SUPREME IN EACH GROUP CAN ALSO WIN CASH FOR OUR JACK POT. AS ALWAYS NO ONE EVER LEAVES OUR PAGEANTS WITH OUT A LARGE CROWN, SASH AND BAG OF GIFTS! COME SEE OUR VERY POPULAR CUSTOM STAGE! REFRESHMENTS SERVED TO ALL OF OUR GUEST! FANTASTIC DOOR PRIZES! ONCE A GROUP IS FULL IT WILL BE CLOSED. SO GET YOU $50.00 DEPOSIT IN NOW TO HOLD YOUR SPOT! Beary Special Last Chance Savings!! ATTENTION H/M & TANNING IF YOU WOULD TO BE ADDED TO OUR LIST PLEASE EMAIL ME! What dose this mean for you?? It means that you will compete against only 13 girls, (you being the 14th) for one of the ULTIMATE TITLES! AS ALWAYS NO ONE EVER LEAVES OUR PAGEANTS WITH OUT A CROWN, SASH AND BAG OF GIFTS! PLEASE VISIT OUR WEB SITE FOR IMPORTANT INFORAMTION ABOUT ROYAL QUEENS OF AMERICA, RULES AND GUIDLINES, WAYS TO WIN FEES OFF AND SO MUCH MORE! Become part of a pageant system that is more.... Where you will make Friends! Meet great Parents! Become part of the RQA Family! For more information please visit our web site! While you are there check out ways that you can win FEES OFF or even FREE ENTRIES! Attention Hair and Make-up and Tanning Artist. If you would like to be added to any of these pageants please email us!! Discover the winning secret that our OPP shooting clients already know! We make Special Compcards just for them that no one else has. It could be anything from Themed, Centerfolds, Music, Holographic and or even Pop-up Compcards. 1 WINNER WILL RECEIVE A 5 DAY 4 NIGHT VACATION TO UNIVERSAL STUDIOS FOR A FAMILY OF 4. This is a first time offer to shoot portfolio in this fashion. Swim Wear and Beauty Looks can all be made into great Portfolios! Beary Special Photo Contest Time!! 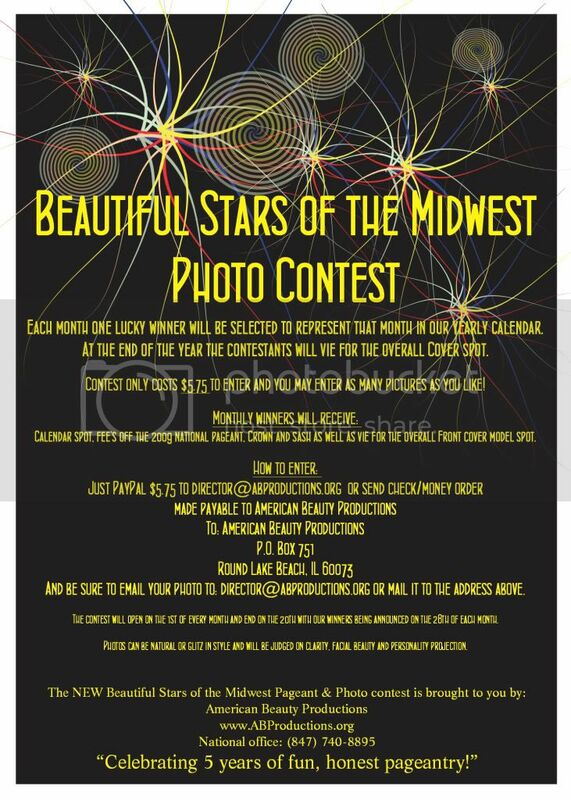 Only $25 to enter BOTH a natural AND glitz photo!! PLUS a free nights hotel !!!!! Tanning, Hair and Make-up. If you would like to be on our list please email me and I will be more than happy to add you! Royal Queens Of America is more than a Beauty Pageant. We strive to build and promote self esteem, confidence, intelligence, integrity, poise and elegance in all of our girls. At Royal Queens Of America we award and recognize young girls and women for their achievements. It takes more than just beauty to become an RQA Girl. Are you one? When competing at any of our pageants you will never be compared to any of the girls in your age group. It dose not matter if you are a size 2 or size 22! We never award extra points for hair, dress, eyes and so on. Our Judges are qualified judges making us a fun and fair pageant system. No contestant will ever go home from any of our pageants with out a large crown and bag of gifts. Before you choose a pageant to compete in on November 22, why not check out Royal Queens Of America. See why so many People have great things to say about this exciting Pageant System that is taking the pageant world by storm! Your Daughter will be glad that you did. While you are there don't forget to sign our guest book for a chance to win fees off and a fantastic prize! Monday Nov. 3rd is your LAST CHANCE!!! Beary Special Early Bird Savings!!! PLUS you can enter UNLIMITED glitz photos!!! Saturday Nov 1st is your LAST CHANCE!!! 5) 1-3T yellow gingham babydoll style dress. Hand dyed and decorated appliqu� on front. Rhinestoned lace collar. Super full skirt. Detachable large bow on back. Matching rhinestoned barrette. $195 + shipping. 7) 2-3T claret Christmas babydoll style dress. Rhinestoned lace neckline and waistline. Gorgeous decorated bow on back. Matching hairbow barrette. $195 + shipping. 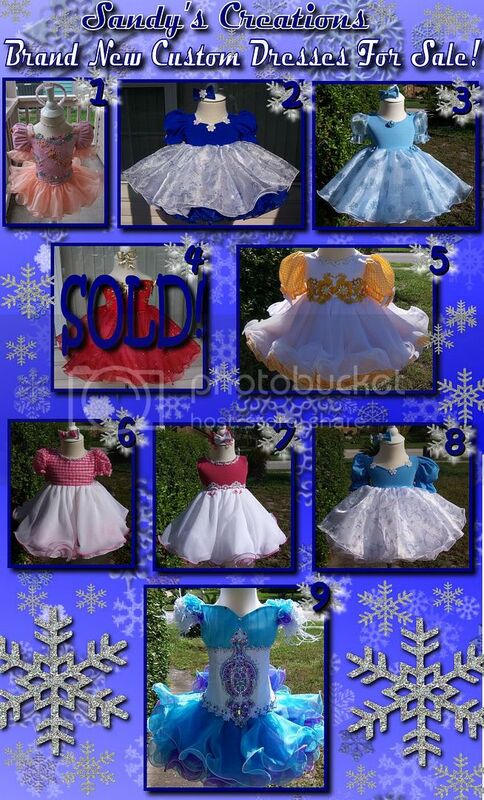 8) 2-3T light blue Christmas dress. Rhinestoned snowflakes on front and back. Gorgeous snowman design glittery skirt with scattered rhinestones. Matching hairbow barrette. $175 + shipping. 9) 4-6 Purple blue white national level dress. Very glitzy! Full skirt. Bustle and backbow. $450 + shipping. Banner By: Home Of The $3 Banners! PLUS you can enter UNLIMITED glitz color photos!!! JOIN US IN OUR HALLOWEEN FUN! NO LATE FEE AT THE DOOR FOR THIS PAGEANT. FEES OFF and FREE ENTRIES to Our National. Not to mention this will be a great time to practice!! We will have 4 Ultimate Grand Supreme Winners! 0 to 2�*�3 to 6 *�7 to 14 and 15 up age groups! Our Huge Custom logo Castle Crown ( shown below) Custom Sash, bag of gifts and cash!! We will Have a Grand Supreme in EVERY AGE GROUP. These Contestants will receive our HUGE CUSTOM CROWN, Custom Sash�and a Bag of Gifts. There will also be a Mini Supreme and Queen in EVERY AGE GROUP. These Contestants will receive a huge crown and bag of gifts. NO ONE will leave any of our pageants with out a large beautiful crown and bag if gifts!! Awesome Sandi Suit and Beautiful Pink Dress! Awarding $5000 Bonds to 3 Highpoints! This Year Could be YOUR Turn!!!!! ENTRY FEE FOR BOTH PAGEANTS ONLY $575 INCLUDING REGISTRATION WHEN YOU ENTER BY OCTOBER 1, 2008. YOU WILL ALSO RECEIVE ALL HIGH POINTS FREE AND ENTRY INTO ARG AMETHYST SUPREME. EVERYONE IS FEELING THE CRUNCH WITH THE RISING GAS PRICES SO WE DECIDED TO HELP OUT BY HOLDING BOTH OUR NATIONAL PAGEANTS ON THE SAME WEEKEND. SAVING YOU TIME, TRAVEL, H&M COSTS, HOTEL AND A TON OF MONEY. WITH THE EARLY BIRD SPECIAL YOU WILL SAVE A WHOPPING $375. THAT�S LIKE GETTING 2 NATIONAL PAGEANTS FOR THE PRICE OF ONE. IF YOU HAVE ALREADY ENTERED ARG OR PP AND WOULD LIKE TO TAKE ADVANTAGE OF THIS SPECIAL YOU MAY STILL DO SO. JUST CONTACT US. IF YOU ARE A PREVIOUS AMERICA�S REGAL GEMS CONTESTANT YOU WILL ALSO RECEIVE A $50 CREDIT TO JOIN US THIS YEAR. SAVINGS FOR PREVIOUS CONTESTANTS IS AN UNBELIEVABLE $425. DON�T WORRY� WE CUT OUR PRICES BUT NOT OUR AWARDS. ALL PRIZES AND SAVINGS BONDS WILL BE AWARDED ON STAGE. SOME OF OUR GIFTS INCLUDE: PORTABLE DVD PLAYERS, IPODS, DIGITAL CAMERAS, STEREO, TELEVISION, DIAMOND BRACELET, EMERALD EARRINGS, SAPPHIRE NECKLACE, RUBY NECKLACE, DIAMOND JEWELRY, WEBKINZ, MUSHABELLY, BRATZ, BABY DOLLS, INTERACTIVE DOLLS, DOLL STROLLERS, DOLL FURNITURE, RIDE ON CARS, GAMES, PUZZLES, STUFFED ANIMALS, TONS OF TOYS AND SO MUCH MORE. $20,000 IN PRIZES TO BE AWARDED. EVERYONE RECEIVES A SPECIAL PERSONALIZED GIFT. NO ONE GOES HOME EMPTY HANDED. REMEMBER AT ARG & PP WE DO NOT PRO RATE. SO WHAT ARE YOU WAITING FOR � SEND YOUR APPLICATIONS TODAY AND JOIN US AT THE BEST DOUBLE NATIONAL EVER. We will have 4 Ultimate Grand Supreme Winners!! 0 to 2 , 3 to 6, 7 to 14 and 15 up age groups! Each will receive our Fabulous Castle Crown, Custom Sash and a Bag of Gifts! and the ONE Ultimate Grand who has the highest pageant score will also receive $500.00 CASH!! There will be a Grand Supreme, Mini Supreme and Queen in EVERY AGE GROUP!! Winning a beautiful large Crown and Bag of fantastic Gifts! 12 to 14 years, 15 to 17 years and 18 up. We will have a Mrs Division if requested before pageant date. NO ONE will ever leave any of our pageants with out receiving a large crown and bag of gifts! We offer refreshments to ALL our Guest and Contestants. We have a huge custom stage that we take to ALL of our pageants!! Free Entries, Fees Off and Prizes!! Want to look you best? Contact these Fantastic Hair & Make-up and Tanning Artist!! COME AND SPEND THE DAY WITH THE STUNNING KYLIE WILLIAMS!!!!! !